2 years. And a little bit, admittedly. 2 years since I had total body irradiation, and all manner of chemicals and poisons pumped into me. 2 years since I’ve had the stem cells of some stranger halfway around the world pumped into me. Time to be a little bit introspective and think about my health in general and the future. Cancer is a horrible, horrible thing to live with. Horrible. No one can quite encapsulate the horror of cancer without going through it themselves. This applies to the patient, the patient’s family and their friends. The horror of cancer (yes, I refuse to give it an uppercase C) isn’t the cancer itself but the uncertainty that follows. Ironically, the treatment for cancer is often as deadly as the disease itself. My mentor, when I was living in Australia, suffered from breast cancer. And she always said that cancer and the subsequent treatment, is a race to see what kills you faster. It’s very toxic. She’s not with us anymore unfortunately and with my latest visit to the doctor 2 weeks ago, He said everything was ‘perfect’ and far from being good news, it got me thinking. Technically, if one is leukemia free for 5 years, one is cured. But can one ever be fully cured? If may be that one never suffers from leukemia again. But the treatment exposes one to other form of secondary cancers (more aggressive, less treatable). The chances of someone random suffering from an aggressive cancer late in life is pretty small, something in the region of 0.01%. In my case, it’s 1%. That’s 100 times more. But!! It’s only 1%. So for now, I’m going to live as much as I can and not think about it. Cos who knows, in 30 years, cancer may be eradicated. I was reading the news a few days ago, and besides struggling to find news articles devoid of the terms bungling, incompetent, shambles and misconduct, the one thing that struck me (and have in previous years), was the use of the word ‘austerity’. It’s become the latest buzzword for the papers and politicians to use. Like dot-com, sub-prime mortgage, double dip and financial chaos. In reality, it means cuts. Cuts to the budget, welfare, NHS, defence; you name it, it will be cut. With the exception of politicians’ salaries and benefits, and of course the breaks given to the super rich of society. We can’t buy anything new, unless it’s absolutely necessary (for the definition of absolutely necessary, see below). We can’t buy anything to replace something, unless it’s beyond repair. No unnecessary outings or holidays, unless it’s to spend time as a family. Something is deemed to be absolutely necessary if we’d die without it, e.g. food and shelter, and even then, it’s only to buy things that we absolutely need, i.e. no champagne or truffles. Or if it’s essential for safety, e.g. if the car’s brakes need changing. Or if something broke and we can’t get it fixed, (e.g. if a jumper was holed beyond repair). Or if Sophie grows out of her clothes, and there are no hand me downs. The idea was actually suggested by an American family, who realised that they were spending more and more time in shopping malls chasing the latest fashion trends and/or the latest gadgets, and spending more and more money, and spending less and less time as a family. So they came up with the idea of not buying anything that they didn’t need. Clothes, gadgets, indulgences were all out. They learnt to sew, darn holes in their clothes, fix broken stuff, spend quiet time together; all unheard of in this increasingly temporary lifestyle. What they found was, besides saving more, they’re spending more time together as a family. Weekends were spent as a family either at home or in other enriching activities. Their children would find very creative ways to make use of old stuff, for example their teenage (yes, you read that right!) daughter converted one of her grandmother’s skirts into a miniskirt instead of going out and buying one. They tried that for a year and after the year was up, they decided that they liked their ‘new’ way of life and continued living that way. Wow. Still here. And coated with a thick layer of virtual dust too. Well, might as well continue updating this site for what it’s worth. It’s been more than a year since my transplant. Honestly the day came and went with little drama. But that’s what we wanted. But things aren’t always smooth sailing. I picked up a persistent eye infection sometime at the end of August. I started seeing floaters, the vision was blurry and my eyes were very sensitive to light. After trying to deny the existence of the floaters (which is pretty difficult when they occupy half of your vision) I made the trek to Moorfields Eye Hospital and was immediately scanned, prodded, looked at and diagnosed. Apparently I have CMV retinitis and it can cause blindness. Luckily for me, the consultant assigned to me has a special interest in retinitis in immunocompromised patients. Unluckily for me, he’s had 10,000 people look into my eye. Long story short, he thinks that my previous CMV reactivation affected my eyes as well. But since no one looked into my eyes, no one knew. It left some scarring and possibly some remnants of the CMV virus in the eye. So now that my body has recovered to a point where it can fight off the virus and heal the scarring, it’s doing that and the result of which is the floaters and blurred vision. He then got really excited, since it’s the first time he’s seen something like this, and he can’t recall ever reading about anything like this. So it’s a unique case. Hurray. So I’m given valganciclovir for the CMV and treated like a lab rat. 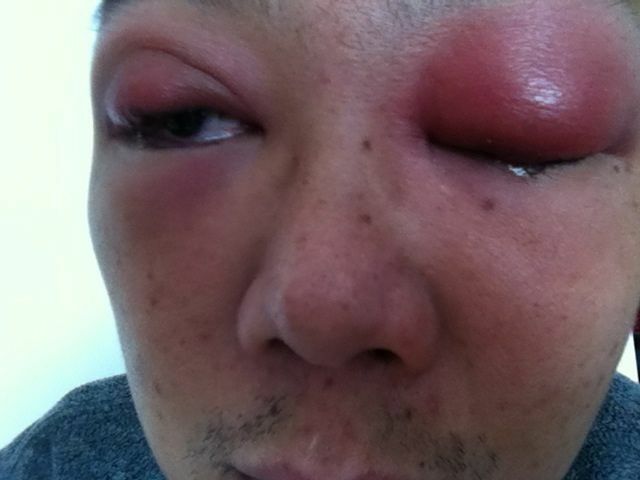 Anyways, a few weeks after that I had a massive eye infection. Valgan murders the my bloodcount so it’s possible that I couldn’t fight off what was a very mild infection. But a dose of Augmentin (co-amoxiclav) sorted that out. But I did look pretty scary for a while. I was laid off work in July. So I’m freelancing now, which is good, as I make more money, but not so good as I get paid by the day, I don’t get paid when I’m in the hospital for clinic and treatments. But the work’s interesting and good, so far. But I’m looking for permanent work to cater for my days in the clinic and (touch wood) if I’m hospitalised again. So far it’s been slow going. Naturally the high up you go in the food chain, the less jobs there are. It’s just the nature of the beast. But in the meantime, I’ll plough on working as a freelancer and make as much as I can before taking the next plunge into the world of the permanently employed. Sophie is 14 months old now. She’s such a joy to be around. She’s speaking (baby speak), calling Mama and Dada, and she’s starting to walk! She can manage to walk a fair distance on her own (albeit a little unsteady). SO many things have happened since I last updated. We celebrated her first birthday, then had to bring her to the A&E at St Mary’s as she had a 40-degree fever. Scary times. Even scarier was the attempt to put a cannula into her arm! Stronger men have cried harder when their baby cries in pain. Not something I want to hear even again. Luckily for us the fever passed after a day and she’s back to her usual bubbly self. The wife has also gone back to work (after 14 months), albeit for 4 days a week. Needless to say, she misses Sophie a lot. We leave her with a nanny, one we found after months of searching. Luckily for us, she loves her nanny and the nanny seem to dote on her too. We moved to my brother’s place in Norbury, which is just outside Croydon in South London. Croydon was also one of the worst hit areas during the London riots last summer. There’s not really much to say about Norbury other than the fact that it’s very different to Notting Hill. The population there is very ‘working class’, not that there’s anything wrong with that, but it’s very different to what we’re used to. In West London, carrying a laptop bag to work is like part of your uniform. But in Norbury, it’s a tool box. Sophie’s Bugaboo looks very out of place here. The main problem with Norbury is that there’s no where to go during weekends. The wife and I end up driving back to West London on weekends just for brunch or to get to a playground for Sophie. And it’s an hour each way so we end up spending a lot of time in the car. Not ideal for an active, restless 14-month old. The good thing is we do save a lot of money. And that I think, will keep us going for a while. It’s been a really long time since I last updated this blog. It was in February. I’ve even had to check my blog for that! Lots and lots have been happening since February. Some good and some bad. This is a bit of a hit and miss. I’ve been fighting a persistent cold (Rhino virus) since December 2011. And it’s just going away. Also, since the CMV virus has reactivated in my body, I’ve been on Valganciclovir and it’s proving to be murder on my blood count. I’ve found myself neutropenic many many times, and needing GCSF jabs almost daily to keep my blood counts up. I’ve also been warded 2 times in the last 4 weeks for infection, the last one a chest infection that took over nearly 1/2 of my left lung!! Not very nice. Thankfully it’s all clear now and even the cold seems to be retreating a little. Sophie’s just turned 9 months old. She’s crawling and learning to walk (every parent’s nightmare). She’s also really curious and very very observant. We’re taking a long deserved holiday back to Asia to see the rest of the family in a few days and everyone’s really looking forward to meeting her. 12:30 – The wife inhales her lunch if she’s lucky. 14:30 – Monkey Music or a walk in the park, if the weather is good. A pretty packed day with plenty of stimulation and activities for the little one, which I’m sure is one of the reasons why she’s so observant and curious. But then the wife is exhausted by the end of the day. Work’s been a bit of a disaster to be honest. While they’ve been very good to me while I was undergoing treatment, now that I am back full time (albeit 3 days in the office and 2 days from home), I still can’t commit the time and energy that I want to due to the fact that I can only travel off peak and need to take time off for clinic visits. So they can’t assign big, juicy projects to me; the very thing I was hired to do. It’s immensely frustrating to see projects like these assigned to someone else. And counting! 22 more days to day +200! Another major milestone. Well, it’s not all be smooth sailing over the last few weeks. I had to go into the hospital 3 times in the last week. First on Monday for my regular clinic sessions, then again on Thursday (more about that later) and then again on Friday (ditto)! When I went in for my regular clinic last Monday, my blood counts were very low. My neutrophils were at 0.1, which was alarmingly low. Knowing that it wouldn’t have fallen to that level overnight, and knowing the stuff that I was up to prior to the clinic, it’s probably a wonder I hadn’t gotten an infection! So the doctors were obviously concerned, and asked me to come back again on Thursday for another test. Plus they gave me a couple of GCSF jabs to help boost my blood counts. What scared me most was that one of the doctors actually told me that they’re worried about a relapse and have booked a bone marrow biopsy for Thursday. But he also said that it was very unlikely that it was a relapse, as my other blood results have been very positive. It was simply a precaution. So on Thursday I dutifully reported into the outpatients department again, got stabbed yet again, but my blood counts were still low. There was some good news though, the CMV levels in my blood were negative and I could stop taking the valganciclovir and the septrin, both of which could cause my blood counts to drop. They also reduced my ciclosporin dose, which would help my immune system fight off this darn cold I’ve had for the last 7 or so weeks. The downside to all the reduction in antivirals is that I need to take an infusion of Pentamidine every month. The good news it that it’s done on the same day as the clinic, so I only have to come in once a week but I’d have to stay longer. The biggest bummer is that I still have to come into clinic once a week. I was hoping that I would be seen less often at this stage, but as they’ve just removed my anti-virals completely, it would be ‘wrong not to monitor’ me, according to the consultant. It’s a drag coming to clinic once a week, and it just takes up so much time. Hopefully I can move on to less frequent visits soon. But for now, looking forward to day +200. I thought I update our timeline a little since it’s been 6 months since the last Sophie’s world post. Things have moved on since then and it’d be interesting to see how far we’ve come and how things have changed. 06:45 – Rise and shine. It’s time for Sophie’s morning milk and since she’s been sleeping in another room, we’ve been lazy. We normally wait and linger in bed till around 7am before getting her in for a feed. 07:30 – Back to bed. She’s normally done by this time, and I put her back into the cot while the wife and I both try to get a little more sleep. 07:45 – Wakey wakey 2. It’s time for me to get out of bed and get ready for work. I have my usual breakfast and coffee and read the morning news over the internet. Sophie’s usually asleep but if she’s not, she’ll be squealing and ‘pffting’ in her room. We usually let her be. 08:30 – Wakey wakey 3. The wife usually gets up at this time and prepares for Sophie’s breakfast of baby rice and milk. Sophie’s usually stirring by now but we let her lie in. 09:00 – Work time & breakfast. I leave for work. The wife feeds and changes Sophie while trying to gulp down her tea and toast before they turn cold. 11:00 – Milk time. It’s time for Sophie’s mid morning feed. The wife’s usually still at play group and feeds her there. 12:00 – Lunch. The wife feeds Sophie her lunch, usually of pureed carrots or sweet potatoes. Yes, after her milk. She’s quite a glutton. The wife tries to enjoy her lunch as well, but usually ends up having cold pasta or soup. 13:00 – 14:00 Kicktime. The wife lets Sophie play around for a few hours after lunch while she does some chores, hoping that she’ll get tired and doze off eventually. No such luck unfortunately. She’s a little pocket rocket that one. 14:30 – Milk time. Yet another feed. She really drinks a lot of milk. 15:30 – Playtime. If the weather’s good, and if Sophie’s not sleeping, the wife takes her to the local playground for some time on the swings and see saws. 16:30 – Nap time. Sophie’s usually tired out from all the activity and takes a short nap. When I say short, I mean about 10 mins. 17:00 – Back, milk time and dinner! I’m home by this time. And spend a precious few moments with my girls before the chores start. Sophie gets her evening snack and dinner while Daddy prepares dinner. 18:00 – Bath time. This used to be scream time. But now it’s wiggle and fight time. She’s not scared of the water, but she just doesn’t sit still in the tub. Add soap and you get a slippery baby. Tons of fun. The wife takes a shower after this while I read Sophie her bedtime stories. 19:00 – Milk time. Sophie tanks up for the night, and usually falls asleep pretty soon after she has her milk. Daddy takes a shower and makes dinner. 20:00 – Dinner. Finally, some adult time. The wife (exhausted) and I (similarly so) sit down for dinner, rarely together as Sophie stirs quite frequently during this time. But we take what we can. We both sit down to get things done after dinner, or at rare moments, unwind. 23:00 – Milk time. Sophie’s midnight snack so she can last through the night. The wife and I also get ready for bed. Midnight – Bedtime. We crawl into bed and are asleep almost instantly. Then the alarm goes, and the day starts over again. Looking back it’s actually quite a change from the time table we had 6 months ago. The big difference is that she sleeps through the night now and the wife spends a lot of time outdoors with Sophie. Exhausting for the wife but good for Sophie.